"The world's most famous enlarging exposure meter" says the instruction sheet. Except that I've never heard of it, and I'm pretty well read on this subject. 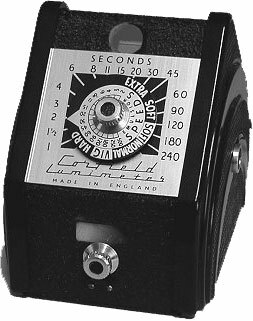 I found out about it from a book called Exposure Control in Enlarging by George Wakefield, whch introduced me to a whole new range of darkroom meters that seem to exist only on the East side of the Atlantic. Perhaps the Brits weren't exposed to the meters on the American market like the Photoval. I never realized how regional and isolationist some of these things are. According to Dr. Wakefield, this was very popular and long-lived in England, and was manufactured by The Rank Organization after Corfield went out of business. The box and paperwork I have all say Corfield, so I suppose I have an "original." I picked it up because it's the only one of its kind that I've seen—a visual comparison meter, not an electronic one. 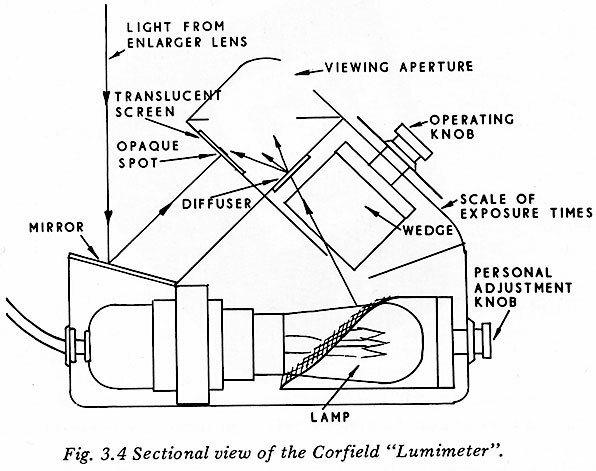 It works on a principle similar to the SEI Photometer: the light from a bulb illuminates a spot in the middle of the image that's taken from the enlarger. The user has a graduated neutral density step wedge in the user's sight path. The user adjusts the wedge until the brightness of the lamp most nearly matches the brightness of the surrounding area being compared. Then dial is calibrated and the user can determine how much light he's seeing. I've never seen one like this for darkroom work, just electronic ones that work like regular CdS light meters. The idea for this appears to have come from World War II era magazine articles. Kenneth Corfield built one and then improved on it, showed his friends and they asked him to build it for them. The original Mark 1 version was very different (see the link), but he further simplified and refined the concept into this Mark 2, which he sold commercially. 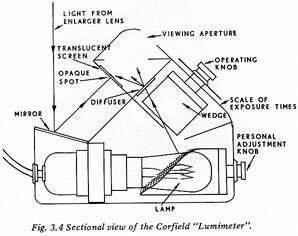 That became the cornerstone of Corfield Cameras.